Technology has never been so omnipresent in the lives of people as it is now. You already talk to your phones, computers, speakers, appliances and many other devices, seeking information or asking to complete a task. You may also have spoken to a robot while seeking customer service from a company and may have even got satisfactory results. One may ask, what next? Would you get similar results if you speak in Hindi, Kannada, Marathi, Punjabi or any other Indian language? Until now it was not possible for machines to understand any language other than English. Now, add another dimension to that - is it technologically possible for two illiterate persons to text chat in their native language? The answer is yes. Thanks to Bangalore based start-up Liv.ai. The start-up has developed breakthrough speech recognition technology in nine Indian languages besides English. Liv.ai has developed this technology with a vision of empowering every Indian to communicate with people and devices in their own language. The biggest of technology companies such as Apple, Microsoft, Amazon and Google have barely gone beyond English where speech recognition is concerned. This technological feat has been achieved by Liv.ai in just three years, a much shorter time frame when compared to the time taken by many big tech firms building speech recognition products. India holds an immense opportunity for technology companies to bring about change as it is home to almost one fifth of humanity with just under 35% Internet penetration. One of the major roadblocks for big technology companies of the world is the sheer diversity of spoken languages in India. While metros and tier I cities have higher usage of technological products, when it comes to villages and remote areas, language becomes a barrier. The internet is bound to grow with the recent tariff wars among telecom companies and government’s push to make broadband available in every village. The only frontier that remains to be won is the simplification of technology in order to facilitate its adoption by people who do not speak English. 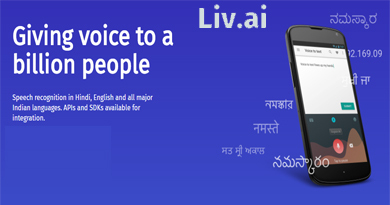 Founded by IIT Kharagpur alumni - Subodh Kumar, Kishore Mundra and Sanjeev Kumar in 2014, Liv.ai aspires to assist non-English speaking Indians in finding their voice through a multi-lingual speech recognition technology. The start-up provides speech API / SDKs to facilitate the conversion of speech to text. "Our API recognizes 10 major languages that are widely spoken in India - English, Hindi, Bengali, Punjabi, Marathi, Gujarati, Kannada, Tamil, Telugu and Malayalam. This speech recognition technology picks up most accents and is adept at cutting out background noise as well," informed Subodh Kumar, Cofounder, Liv.ai. "While Microsoft and Apple do not support regional Indian languages, and Amazon's Alexa supports only English, we're proud to be pioneering extensive speech recognition technology development in Indian languages," he added. One of the driving forces behind the founding of Liv.ai was the incapability of Indians to communicate with machines in their mother tongue. With this motivation, the team started working on developing more humane and intuitive machine learning technology. Especially in India, a populous country with a plethora of spoken languages, the start-up predicts that speech is likely to be the next pervasive interface. It is touted that the speech recognition API market could grow into a billion-dollar market over the next five years. Besides speech to text, Liv.ai is also working on Speech Synthesis and conversational systems. Last year, the start-up had brought out the speech to text APIs into the market. "The API has a decent traction with an approximate of two million API hits per day across 10 languages. We have partnered with over 10 large businesses belonging to multiple domains to take their product to the masses. The domains encompass e-commerce, BFSI, consumer devices, speech analytics, robotics and consumer apps. Owing to the demand for the API, plans are underway to upscale from two million API hits per day to 100 million API hits by this year end," said Kishore Mundra, one of the founders of Liv.ai. With a continued focus on Indian languages and dialects, liv.ai aspires to put together the best AI team in India. The start-up is looking to develop disruptive speech-based technology solutions to overcome some of the biggest AI hurdles. Being rooted in India gives liv.ai a far better user insight than any other large global company would. Liv.ai is proud of the engineering culture that it is creating in India. The start-up is one of the rare companies working in the core Deep Tech space and inventing cutting edge AI algorithms. It has solved a lot of hard science and tech problems in Deep Learning to create Speech recognition and dialogue systems for multiple Indian languages which suffer from such a variety of accents. Liv.ai will continue to attack the hardest problems in this field with a desire to put India on the global AI map. "India has traditionally been an IT outsourcing hub with very little tech innovation while most of the global wealth generation in technology has been to the pioneering companies in Silicon Valley. We wish to change that impression through our work. The slowing growth rate of our leading IT companies means that the days of exploiting labor arbitrage is over. Now we need to aim higher and build world class tech product companies in India. Our engineers and scientists should not be dependent upon the whimsical immigration norms of another country to work on intellectually challenging problems and creating an impact on the lives of hundreds of millions of people. Companies like us are the agents of change in this process," said Dr. Sanjeev Kumar, Co-Founder and CTO of Liv.ai.